Mud is what I would imagine a modern day Huck Finn to be like. The title character, played excellently by Matthew McConaughey, is a bit of a drifter, who is hiding out in an abandoned boat on an island waiting for his girlfriend, Juniper (Reese Witherspoon), to meet up with him. Juniper, however, has no idea that he's on the island, so it may take her a while to find him, and in the meantime, we get a coming-of-age story concealed as a "con man does good" plotline; it's the former, however, that makes Mud as good as it is. Ellis (Tye Sheridan) and his friend Neckbone (newcomer Jacob Lofland) take a small boat to a nearby island, to look for an unusual boat they've heard about: it's stuck in a tree, probably from some storm. When they get there, however, they find that the boat is already inhabited, by a man who introduces himself to them as Mud (McConaughey). Mud spins a story to them about true love and waiting for Juniper (Witherspoon) so that they can be together; the naive Ellis, however, later finds out that there is more to the story. When Ellis and his mother (Sarah Paulson) pass through a highway roadblock one day, they're shown a picture of a wanted man, and it turns out to be Mud; Ellis confronts him about it and Mud tells them his secret, and part of the reason he's waiting on the island for Juniper rather than looking for her in town. Ellis and Neckbone must decide if they want to help Mud, now knowing his past, or if they should leave him on the island by himself. Matthew McConaughey seems to be expanding his repertoire lately, from The Lincoln Lawyer, to Magic Mike, and now Mud; from the late '90s to 2010 or so, he was in a lot of romcoms that I liked (How To Lose a Guy in 10 Days, The Wedding Planner, etc). He's definitely up to the challenge, however, and he is fantastic in this movie. The two boys in the film, Sheridan and Lofland, were also great, and I was shocked to learn that this was Lofland's first on-screen appearance; he plays his role like a seasoned veteran. Witherspoon is decent in the movie but her character isn't really needed, in my opinion, other than to provide a backstory for Mud and the reason as to why he is on the island. Ray McKinnon, Sam Shepard, and Michael Shannon have supporting roles in the story, too, and do well with what they are given. Despite all this, and my star rating (see below) for the movie, I'm still giving it a Maybe. The reason for this, as it always seems to be, unfortunately, is its pacing. I will confess that I fell asleep for about ten minutes during the film - but, to accurately write this review, I asked others what transpired in the film during those ten minutes - and the reason for that is because this movie is just so, so slow. One could argue that it flows at a Southern-type pace - I believe the story takes place in Arkansas - and you might be right, but that's still no excuse for the movie to be as slow as it is. The runtime is 2 hours and 10 minutes, as well, which does not help. If you are the type of person who can stand a slow story, as long as the payoff is good - which it is, in this movie - then definitely see Mud; if you're like me, and tend to fall asleep after a long day, then bypass it, unless you want to pay $10 to take a nap in a movie theater. 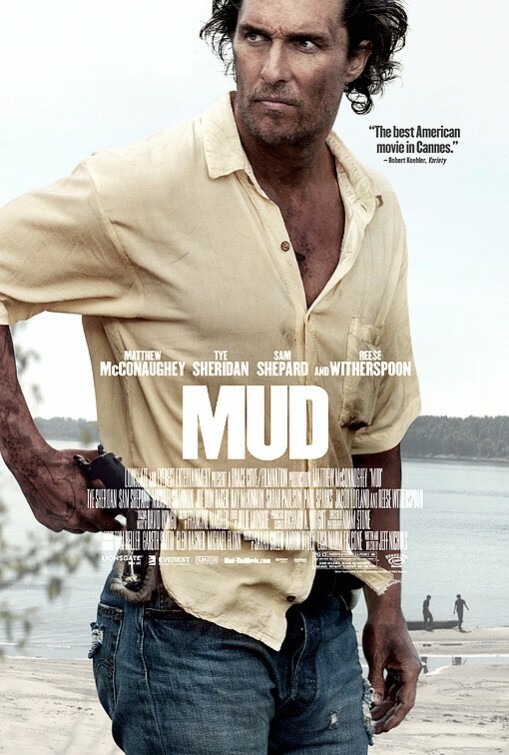 Mud is in theaters today, April 26th, and is rated PG-13 with a runtime of 130 minutes. 3.5 stars out of 5.